Photos of the March 3, 2007, lunar eclipse. Credit: Antonio Finazzi and Michele Festa of Lago di Garda, Italy. Close your eyes, breath deeply, let your mind wander to a distant seashore: It's late in the day, and the western sun is sinking into the glittering waves. At your feet, damp sand reflects the twilight, while overhead, the deep blue sky fades into a cloudy mélange of sunset copper and gold, so vivid it almost takes your breath away. Early Tuesday morning, August 28th, the dream will come true. There's going to be a colorful lunar eclipse visible from five continents including most of North America: map. The event begins 54 minutes past midnight PDT (0754 UT) on August 28th when the Moon enters Earth's shadow. At first, there's little change. The outskirts of Earth's shadow are as pale as the Moon itself; an onlooker might not even realize anything is happening. But as the Moon penetrates deeper, a startling metamorphosis occurs. 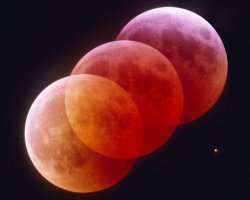 Around 2:52 am PDT (0952 UT), the color of the Moon changes from moondust-gray to sunset-red. This is totality, and it lasts for 90 minutes. To understand why the change occurs, close your eyes and dream yourself all the way to the Moon. Once again, you're standing on a seashore—the Sea of Tranquillity. There's no water. You're surrounded by hundreds of miles of dusty, hardened lava. Overhead hangs Earth, nightside down, completely hiding the Sun behind it. The eclipse is underway. With the Sun blocked, you might expect utter darkness, but no, the ground at your feet is aglow. Why? Look back up at Earth. The rim of the planet seems to be on fire. Around Earth's circumference you see every sunrise and sunset in the world—all at once. This incredible light beams into the heart of Earth's shadow, transforming the Moon into a landscape of copper moondust and golden hills. Wake up! This is really going to happen, and some planning is necessary. Start times of totality are listed in the table below. Set your alarm an hour or so in advance to gather snacks and dress warmly. (Even in August, four o'clock in the morning can be chilly.) Waking up early also allows you to catch some of the partial eclipse before totality. The eclipse will be visible from Australia, Japan, parts of Asia and most of the Americas, but not from Africa or Europe. Pacific observers are favored. On the west coast of the United States, the entire eclipse will unfold high in the post-midnight sky. On the east coast, totality will be truncated by sunrise. That's okay; even a little eclipse can be a dream.